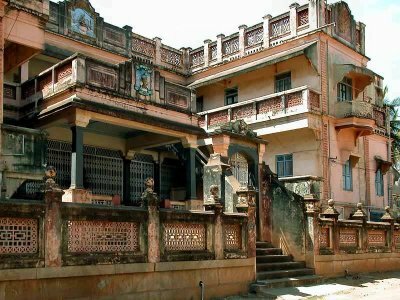 Chettinad is rich in cultural heritage, art and architecture, and is well known for its houses, embellished with marble and Burma teak, wide courtyards, spacious rooms, and for its 18th century mansions. Local legend tells that their walls used to be polished with a paste made out of eggwhites to give a smooth texture. The construction material, decorative items and furnishings were mostly imported from East Asian countries and Europe. The marble was brought from Italy, chandeliers and teak from Burma, crockery from Indonesia, crystals from Europe and wall-to-wall mirrors from Belgium. The woodwork and stonework was inspired that of the houses in France and other European destinations. I am from Chettinad and really very proud about it. I m very proud to tell,i m frm nagarathar family,not only architecture,food,traditional cultural and nagarathar marrige are also very nice. it's amazing pictures. the marvoulas building technology. HAI I AM HARISH. UR PICTURE IS VERY NICE. I AM CRAZY ABT UR PICTURES. CONGRATS. I don't think I will be able to build or live in such a big house.At least let me have a chance to see it in my lifetime with my own eyes directly. really it is excellent. i like to c all chettinad mansions.i admired the architecture in previours era. my gdnss.... they r jst phenominle.... these photos hv hlpd me too mch in my assignment. Thanks for sharing these wonders!!! Amazing snaps. Reminds me time and again of the sensitivity and meaning of Indian architecture. Thanks for posting the snaps. All photos in this section is very amazing. This is my first i saw like this houses in my life its really superb. Other chettinad photos to be displayed for others view including the front entrance door with fine arts. this a very good effort taken but can be continued with other chettinadu places or throw an email to chettinadu peeople to put their own clipings and details on building architecture if possible. Wonderful to view it. Fantastic work, keep it up.